With minimal sleight-of-hand, eight (regular) antique-looking cards (four red/four black) are used with an "OIL & WATER" patter routine. You start by openly mixing (alternating) the reds and blacks. You then show that the colors have magically separated. (NO awkward/complicated handling!) Finally, the cards seem to automatically - and MAGICALLY - re-mix. Can be performed strolling (standing) or at tables! You start & end clean - no fakes/extra cards or switches, either! It's that strong - that easy! 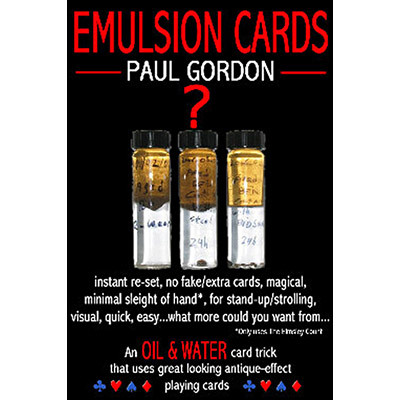 Antique-effect cards (Heirloom Cards) supplied. If you like Corner of Piccadilly - you'll LOVE this!